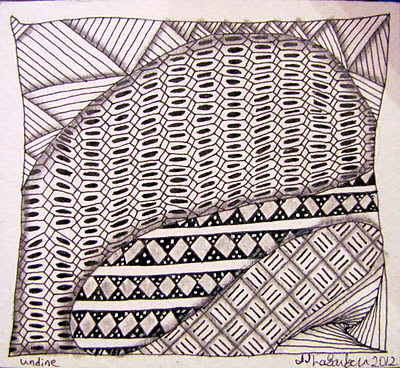 I look at Undine and can see all the possibility in the tangle. I didn't experiment with shading this one as I made it on the small side. I think that if I remember to make it bigger next time though, I can find some room in there for shade. As it is, I added a black oval in the center to give it a little more detail. I think it looks like cells under a microscope. I'll definitely keep this in mind when doing something nature or science themed. I made up a little tangle there on the right bottom. I think anyway. I'll have to explore and see if there is one like it already. It's based on a pattern I saw in the Peacock Room in Washington, DC. I need to work on it a bit more as well as it isn't quite how I'd like it to be. This is a short post today. I am working on a sepia zendala and I can't wait to get more done! Have a great day! Very nice! I've been to the Peacock Room...it's amazing! But I visited it before I was a tangler. I'll have to go back and look at it with new eyes! I've asked tanglers before, and no one came up with an answer...what do YOU call the tangle you featured along the top? Just curious! I use it a lot, and have seen it in the work of others, but have never seen it named.